1. In small bowl, combine 2 teaspoons salt, garlic powder and pepper; rub mixture over beef. Heat 7- to 8-quart heavy bottom pot or Dutch oven over medium-high heat. Add oil and heat until hot but not smoking. Add beef and sear each side 3 to 4 minutes or until browned. 2. Add tomatoes with juice and broth. Heat to simmering over high heat. Cover and reduce heat to low; cook 2 hours longer. 3. Add mushrooms, onion, carrots, celery and thyme. Heat to simmering over high heat; reduce heat to low and cook 30 minutes longer or until vegetables are tender. 4. Transfer beef to cutting board; cover with aluminum foil to keep warm. With slotted spoon, transfer vegetables to bowl. Heat liquid remaining in pot to simmering over high heat. In medium bowl, combine sour cream and flour. Transfer 2 cups hot liquid into sour cream mixture, whisking constantly, then whisk sour cream mixture into pot. Heat to boiling over high heat; add remaining 1/2 teaspoon salt; reduce heat and simmer 10 minutes. Add vegetables back to pot with sauce. 5. 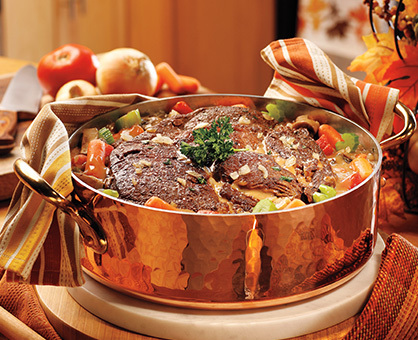 To serve, slice beef and spoon vegetables and sauce over sliced beef. Garnish with parsley sprigs, if desired.